At Prototype Thinking Labs, our core philosophy is not about whether something succeeds or fails, but how quickly we are learning. Everything we create centers around the user: understanding their needs, speaking their language, and above all making their life better in a substantive way. We customize every offering for your specific needs. 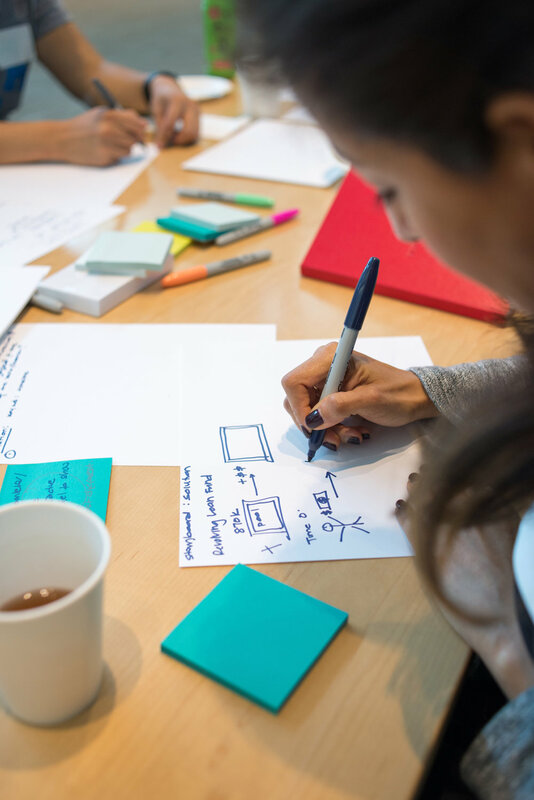 Through these offerings, your teams will increase their depth of user understanding through empathy, deep listening, careful observation, and experimental interaction on both a conscious and subconscious level. A one-to four-day Prototype Thinking intensive is at the heart of our process. Participants will solve a major problem on a real product offering or program - no toy problems here. You will gain extensive practice in Prototype Thinking and a deeper understanding of how to delight your stakeholders. This can be held as an offsite or as part of broader organizational change. A Prototype Thinking Retreat takes place off-campus or outside of your workplace. We spend time practicing the methodology and engaging in exercises and games in empathy, listening, communication, and mindfulness. We work closely in creative groups on your real problems, testing with real users, and finding real solutions. Our consulting practice works with you to identify highest points of leverage in your organization. We partner with you to create innovation toolchains that help your organization make faster, evidence-based creative decisions from user outcomes. Join us in San Francisco, or bring our team to your offices anywhere in the world. We offer long term consulting to implement a Prototype Thinking mindset across the company. We help every team adopt best practices at the infrastructure, process, and cultural levels. Change starts with visibility into your organization. We will dive deeply into your people, processes, and programs to map out current practices and identify opportunities for transformative impact.